1. He/she received very little information about your company in the ad (105 characters to be precise, including the URL) so it pays to consider the person uninformed and unconvinced. The reader who clicks on an email, by comparison, has received far more information and is therefore going to be much more inclined (and ready) to complete the registration process. 2. He/she could be anywhere on the buying spectrum – from initial research and education, to final, I-want-to-buy-one-of-these-today evaluation. Unless you have the time and resources to create different landing pages and offers tailored to specific buying stages (and the keywords that are a clue to those stages), your offer has to cover all bases. We work with a lot of SaaS (Software as a Service) clients, and the inclination for those companies is to offer a free trial or download of their product. As we discussed at length in this earlier post, the problem with free trial offers is they eliminate the subset of prospects for whom a free trial is simply too much of a commitment as an initial response. 2. a trial offer is of limited appeal to the majority of search traffic, namely those prospects only conducting cursory research and seeking solutions to a particular business problem. and so on. Plus the kit approach enables you us to present multiple content items as one singular offer, which focuses the copy and avoids distracting or confusing the reader. 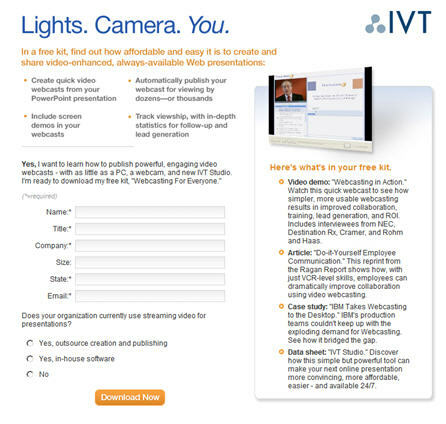 Above is an example of a successful landing page we created for IVT (Interactive Video Technology), a client in Los Angeles that markets a line of corporate Webcasting solutions. The information kit features a demo and product brochure (for those more advanced prospects), an educational white paper (for prospects not yet sure whether corporate Webcasting is for them), and a case study providing more ready-to-buy prospects a strong customer reference. That way, the trial is available for those who want it, but it doesn’t scare off those who don’t. This entry was posted in B2B Marketing, Demand Generation, Landing Pages, Offer Strategy, search marketing, SEM and tagged b2b demand generation, b2b lead generation, Landing Pages, paid search, PPC, search marketing, SEM on October 14, 2009 by Howard Sewell.